The team at Total Cover Shade & Shelter are often asked to consult and give advice to retirement villages and rest home management. These management teams know how important it is that their residents avoid the weather extremes of both summer and winter. 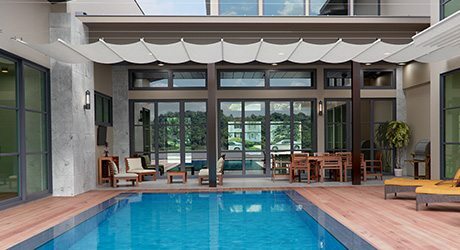 Whether it’s a small deck area or a large outdoor area such as an eating area or games area, we can custom design, manufacture and install Retractable Awnings to protect your residents from the harsh UV rays. A cold wind is not conducive to good health in the elderly. Whether it is in private living areas, or in communal areas, a stylish, and well-designed and manufactured drop screen or blinds can make all the difference. Total Cover Shade and Shelter design, manufacture and install screens and fixed panels that will create a cosy space on even the windiest evening. And, when the sun comes out again, our drop-down curtains and screens are easily rolled up out of the way. 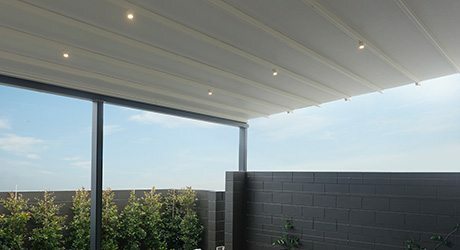 We can use sun mesh to block out the sun to protect your residents from the harsh UV rays or they come in Clear PVC for medium wind and rain protection. You can also have automated screens for complete ease of use. 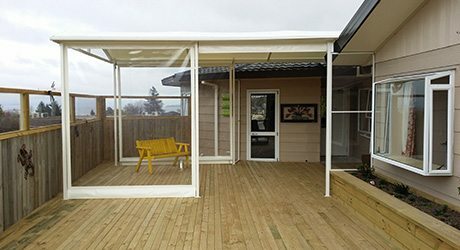 Many retirement villages and rest homes have deck areas that would benefit from a more permanent weather shelter or shade structure. 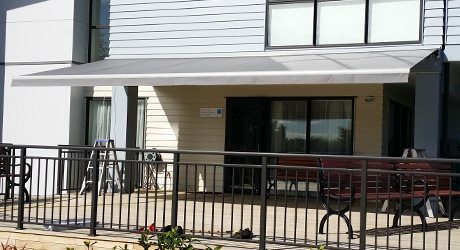 For a strong and robust roof for the outdoor spaces around your rest home or retirement village, you can’t go past a fixed frame canopy or Tensioned Membrane Structure with either heavy duty PVC or polycarbonate roofing. 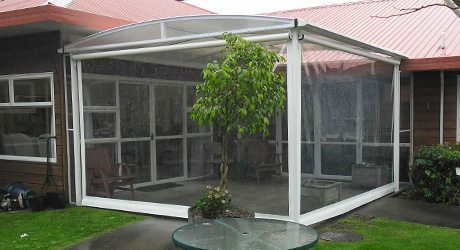 A Total Cover Shade and Shelter canopy provides additional outdoor living space with protection from the rain and harsh UV rays. Add screens to create an outdoor room that can be enjoyed year round.